Nature’s Art Box , a wonderful book Tomas and I found on Amazon a several years back. I wish we’d taken pictures of our past creations, as there have been some wonderful ones — birds, crocodiles, hedge-hogs, and reindeer. All you need is a dinner/craft table strewn with bits and pieces dropped from trees, and some glue — we opt for the hot glue guns, though they do require a bit more adult supervision than our typical projects. This has got to be one of the most satisfying art projects out there. It’s really pretty–I wish we had pinecones like that here. You’d think they’d be bigger around here or something . . .
And by the way, I’ve been enjoying your blog lately. 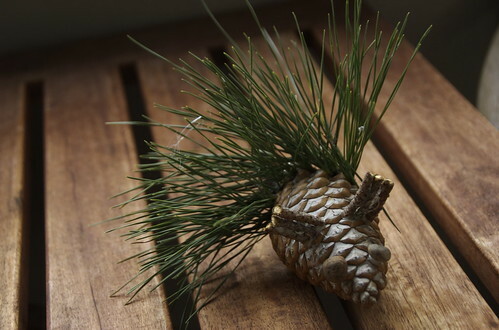 Is this the only thing you have for decorating pinecones I keep on searching but, this what I get .I just don’t get it ,do you have more that I can view . I’m looking for a deer made of pinecones .